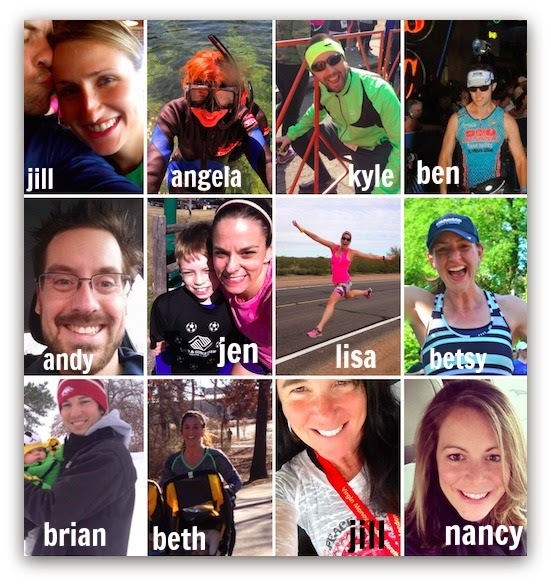 Next Friday I'll be joining 11 other people for Team Beauties and the Beast(s) at Ragnar Cape Cod. While I have gotten to know a few of them, as bloggers, over the past few years, I only personally know 3 others on my team - Jill, Andy, and Angela. I've gotten to know Jill W, Nancy, and Beth through their blogs and Facebook. Now I get to meet a few new teammates and will have an absolute blast doing so! My sister-in-law and one of my running girls. Fun fact: "I am not cool or interesting, and I don't run very fast; however, I am cute, sarcastic and predictable. That has to count for something, right?" Well, and she does wear Spandits too! And another fun fact, we are married to twin brothers. Each of us have a 10 year old boy - Tucker and Jackson and we have two girls - Isabella (5) and Scout (4). How in the world did we arrange that? Oh, and we are both Special Education Teachers who went to the same college but didn't know each other while at college. And we're both from Pennsylvania. Craziness. Okay, I think I'm done with the Jill fun facts. For now. Fun fact: "I lived and taught on an off-shore island in Maine for 5 years. I have traveled throughout Europe in college and paraglider off a Swiss Alp". Another fun fact - Angela and I met a looooooong time ago when my family used to vacation in Maine at her grandparents camp and then we met again at college. Crazy small world. Fun fact: "I have a twin brother and we finished an Ironman together in NYC." We met Andy when we did Reach the Beach 2 years ago and he actually lives in Gardiner. Fun Fact: "I'm the coolest person I know. I dare you to find someone cooler. I started running less than 2 years ago and am always trying to improve any way possible"
Fun Fact: "I have a black belt in Taekwondo." Fun Fact: "In January I finished up my 3-year long quest to run a half marathon in every state- bittersweet to finally be done, but enjoying all the extra time in my schedule! " Fun Fact: She's training for Country Music 1/2 Marathon, probably another half in the fall, and a yet to be determined fall marathon since my NYC lottery big was unsuccessful. Probably a few 5ks and 10ks thrown in the mix as well. Fun Fact: "My husband and I just adopted 2 baby boys who are a month apart from each other and are 6 and 7 months old." Fun Fact: "I am a full-time professor and head coach for a college hockey team and just adopted two boys who were born in Aug and Sept. I'm also 5 minutes away from qualifying for Boston!" Fun Fact: "My outifits have to match when I run. Traveled all over the world. Been on a safari in Kenya; Met Princess Diana, flew the Harrier jet simulator; Sat in the cockpit on landing into Hong Kong; Love shopping for bargains; Love giving and helping others, especially beginner runners; Placed 3rd in my age group for a duathlon; Finished my first Spartan in Fenway Park!" Fun Fact: "Other than being your average running mama of 2 who has run over 28 half marathons in 4 years after the birth of my oldest daughter, I am an ESL teacher of new elementary aged refugees and a college professor of over 10 years. Basically I have three hats I wear...my mom/wife hat, my teacher hat, and my crazy runner hat!" So awesome! I keep trying to make a Ragnar date work with life and family! I will never give up! I will run a Ragnar. Congratulations to the team! Have a great race!! Oh you should!!! It would be a blast! It is so hard to make these things work with families and work and life. It has taken tons of planning and stress to make sure the kids are taken care of while I'm away. You will do one!!! Yay! I can't wait, so much fun to be had! You're going to have so much fun!! So Jelly!! So excited for you! I did Ragnar So Cal last month and it was the experience of a lifetime! Have a great time! I have never done a ragnar. they sound so great. They do sound like an awesome group! Cannot wait to meet the people I don't know!!! Oh I've never done Ragnar before either....only Reach the Beach. But it's going to be fun! yay- so excited to meet everyone- going to borrow your collage and finally do a quick write up before heading out!